Anyone who follows design, surely has seen this on TheDieLine.com. 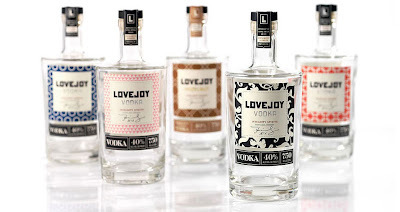 But for those of you who aren't as design-inclined, yet lovers of the 'vod-ker', will delight in this fantastic specimen, LoveJoy Vodka, designed by ID Branding. I love the fact that the spirits industry has embraced design w/playfulness (ala Effen vodka, Screw Kappa Napa and Used Automotive Parts wine(s), to cite a few). This whimsical approach completely influences my purchase decision. I have had many a night w/B where we will sample a wine and not like it. Yet I am quick to state,"...but isn't the label design amazing?" And I'll proceed to point out every nuance in the graphics and/or wording. Somehow the coin dropped for these short-lived purchases doesn't seem like such a loss. Don't you feel the love for LoveJoy? Yeah, Baby, I sure do. Back in the day, B + I would go see this band and man,for a skinny front man, Happy Chinchester could command the audience. He projected pure, unadulterated, raw energy. He paraded around on stage in white angel wings far before those Victoria's Secret gals did. Kudos, Happy. I don't have the mp3 of this tune. iTunes has a 'new' video, which barely captures the energy of which I speak. So, the best I can say, is close your eyes and just listen... and feel. Columbus has been blessed w/some great local/regional talent. The Why Store hails from Indianapolis and geez louise, the sound and energy they create is simply a whole body experience. What can I say, I am a sucker for a great lead who commands an acoustic guitar (and it doesn't hurt that this lead dude, Chris (I think) looks somewhat like, um, er, oh, ... Jesus. Helps create a following. lol) I will def. post more tunes from them. Mister M loves them..."Mommy put on that water song..." Cute x a ton. I saw these guys @ Lollapolooza last year and they did not disappoint. This song just makes my skin crawl (in a good way) when he hits those drawn out screechy notes. Nice. This song is emblematic of how my internal tickings go. On most days, this is the beat in which I operate:getting Mister M ready for the day, designing, working out... just an internal tempo I have been blessed with. When I heard this song and it's ridiculously fun lyrics I thought, "Do these guys know me?" Good times. Cheers! A votre santé! Salut!